From the very first "Who are you?" to the final "What other prayers does the Church recommend?" 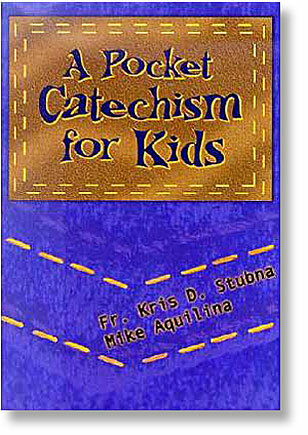 A Pocket Catechism for Kids is the ideal introduction to the treasures of the Catholic Faith for children in kindergarten through grade 8.Using a popular question-and-answer format, authors Father Kris Stubna and Mike Aquilina explain the saving truths that Jesus taught in short, easy-to-understand-and-memorize sections that draw from both Scripture and the Catechism of the Catholic Church.Examining the basics, A Pocket Catechism for Kids serves as both a primer on the Faith and a readily accessible resource and reference guide. A Pocket Catechism for Kids also contains sections on traditional Catholic prayers, a guide to making a good Confession, an explanation of the Mass, and more - virtually everything children need to know to understand and live the Faith! 125 pages.